Weather: Mainly fine, light wind. Food highlight: Entrée of creamed goat cheese, roasted fennel, cherry tomato salad, parmesan wafer and olive tapenade. We staggered down into battered steel loading bay of the Anadyr car ferry, clutching our cameras and outsized bags and checking each other out. Within minutes all of us – from Australia, Japan, Russia, Chekia, Switzerland, U.K., Canada and the US - were being welcomed on the deck of the Professor Kromov (a.k.a. Spirit of Enderby) and offered tea and scones in the dining room. Thus began our 15 day voyage into one of the most remote and wild places left on earth: Chukotka in the Russian Arctic. Anadyr where we started is a frontier port town without a land-link to the rest of the country, populated largely by coal-miners, administrators, the military and indigenous Chukchi. To the west is a vast and virtually trackless wilderness of tundra, wetlands, lakes and rivers for thousands of kilometres. Moscow is 8 time zones to the west, or as they say locally, “God is a long way off, but Moscow is even further”. Weather Mainly fine, light SE wind. Lectures Introduction to the seabird cliffs by Sarah. Seabirds occupied every possible (and many seemingly impossible) ledge and crevice of the the cliffs at Preobrazhenia! Flying seabirds scribbled themselves all over the sky: Tufted and horned puffins flying back to young with fish hanging neatly out the sides of their beaks; common and black guillemots carrying their fish neatly, tails frontward. Crested and parakeet auklets swarmed, as Sarah described them, like bees from a hive. Once round the cliffs, we went in stern-first by zodiac to the stoney beach at Preobrazhenya Bay, eased in to shore by Rodney in chest-high waders. Once all were ashore we ambled upstream and inland for a look around: Imagine an undulating plain of grasses, flowers, edible berries and mushrooms, the sharp scent of herbs underfoot, ground-hugging willows and birches, ground squirrels, clear-running stoney streams. Then imagine that it stretches out without fences or roads almost as far as the imagination can travel. It is called tundra and it is simply magnificent. Places visited Yttygran Island (whale bone alley), Gilmymyl community, tundra and hot springs. Weather 8 degrees, rain and wind in the morning followed by a cold front from the NE, clearing in the afternoon. Sea conditions Moderate swell, choppy sea. Lectures Katya on the archaelogical site known as ‘Whalebone Alley’. We sailed around Cape Providence at 6am, hoping for calm whale-watching conditions for zodiacs. From the bridge we had spotted five orca cruising the rocky shoreline, as well as a number of grey whales. However the wind picked up ahead of a front so we sail directly on to Gilmymyl, within Beringia National Park. 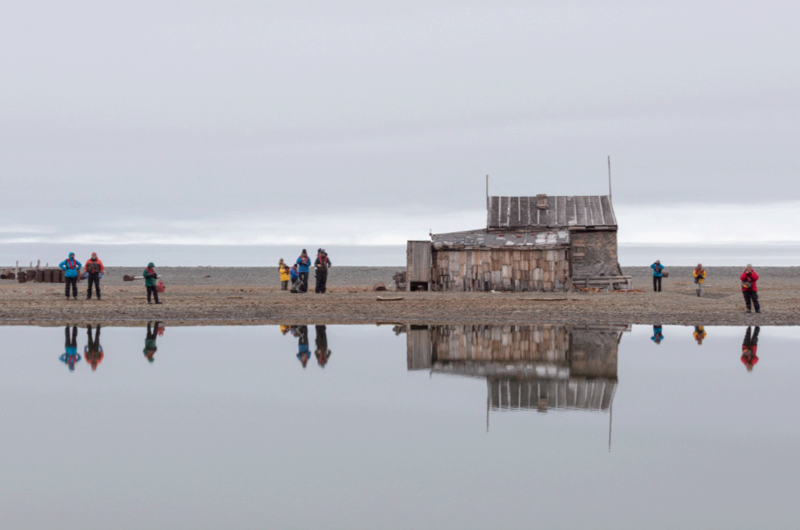 A: Visit a Chukchi family with Katya and Agnes, followed by a soak in the hot pools. B: Go birding with Sarah and Chris, followed by the same. C: Go directly to the hot pools, led by Rodney! Gilmymil, once a permanent Chukchi settlement, is now used by a handful of Chukchi and Eskimo families as a summer residence. Situated in a spacious basin, Gilmymil has plentiful food resources available from sea, lagoon, river and tundra. While the Russian crew scoured the hillsides for mushrooms and berries, the rest of us peered through binoculars, chatted with a Chukchi family or just soaked in the large timber-constructed hot pool, fed by thermal springs in the hillside and situated close to an ice-cold river for cooling off. Places visited Cape Drezhnev and Naukan Village; Uelen settlement. Weather Fine and clear, light SE wind. Wildlife highlight First walrus sighting, grey whales spouting, ground squirrels and voles at the former village of Naukan. Cultural highlight A slow meander through Naukan Village. Landscape highlights Visiting Cape Drezhnev, the most eastern point of continental Eurasia. Dramatic highlight The VERY WET landing at Uelen Beach. Lectures Katya on the history of Naukan Village. Rodney’s briefing on the settlement at Uelen. Katya gave us a quick briefing straight after breakfast on the history of Naukan Village and Cape Drezhnev: Naukan was an Eskimo (as they call themselves locally) village of marine mammal subsistence hunters for thousands of years. Its location on a relatively protected terrace overooking the narrowest point of the Bering Strait made it perfect for hunting. The village had about 400 people living in 83 yarangas (traditional round houses covered in skins), wooden huts and dugouts. That all changed in 1958 with the Cold War, when Soviet officials forcibly relocated the residents to other villages and towns. The border guard post built only a stone’s throw from the empty village was in its turn abandoned after the demise of the USSR and is now crumbling into the sea. We landed by zodiac and wandered slowly through the ruins, pondering the lives and commmunities whose lives echo here still. Once around the point we sailed west to Uelen Village, built on a long sandspit and the site of a 2000 year old marine mammal hunter settlement. We anchored offshore and took the zodiacs in through the surf. Rodney predicted a ‘very wet landing’, which turned out to be accurate, if understated: the zodiac drivers backed in stern-first, each met and held by a pair of staff members standing waist, chest (and sometimes neck) deep in the surf to hold the boat steady against the breakers. Everybody tumbled out (sometimes literally) as quickly as possible so the zodiacs could be relaunched before taking on too much water over the bow. Nobody stayed completely dry, with a number becoming very wet. The Soviets set up a bone-carving school at Uelen, so consequently there was a wide array of carved and painted walrus tusks in the local Museum, along with beautifully crafted seal-skin clothing and artefacts. 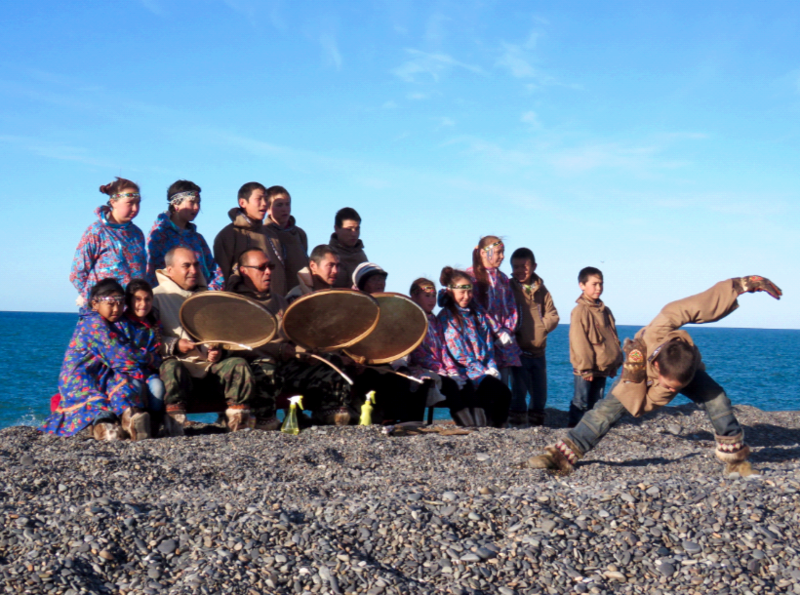 After wandering the rather bleak main street and playing with some very fit and fun-loving local children, we were treated to Chukchi dancing on the gravel beach. With so many of the adults away hunting or gathering, the dancing was done mainly by children, accompanied by men singing and beating walrus-skin drums. The dances represented animals and every-day events in the lives of a hunting community: a walrus behaviour, a walrus hunt, pairs of loons, friendship, gathering birds’ eggs from the sea-cliffs, and even a ‘white man’s dance’ – an amusing depiction of European ballroom dancing through traditional Chukchi music and dance. Getting back into the zodiacs was a wonderful piece of theatre, even wetter than than the landing and much re-lived over dinner. Wildlife highlight Kolyuchin Island Bird cliffs and walrus haul-out. Lectures Katya on history geography of Wrangel Island. In spite of the clear day there was an ‘ice-cooled’ bite to the air. Once Katya and Samuel had gone ahead and checked out the abandoned weather station for resident polar bears, we took the zodiacs across to Kolyuchin Island and climbed up a grassy slope to vantage points above the bird cliffs. Every ledge was seething with adults and chicks of gulls, puffins, kittywakes, guillimots and pelagic cormorants. After thawing out over lunch, we revisited the island to observe a walrus haul-out, mainly males, that we has seen from the sea before lunch. We sat quietly on the steep rocky hillside immediately above them and photographed them to our hearts’ content; as they hauled themselves awkwardly out of the water or lumbered about to find a spot to squeeze in and lie down, provoking annoyed prods and threats from those disturbed. There’s something mesmerising and almost soothing about the sight of 500 rotundalruses crushed together, squirming and sleeping in the sun, flippers over each others’ enormous fatty flanks. The Chukchi hunters at our boat-landing were holding a ceremony to commemorate a friend who had recently drowned on a fishing trip. They told us that a polar bear had visited the beach an hour before our visit. It’s dinner–plate sized pads were still evident in the mud. Needless to say, while most people watched the walruses down below, staff took turns watching out for the bear above. Weather Light fog, light SE wind. We sailed right through the night and awoke to a seascape dotted with sea-ice, glowing through the morning mist. Occasionally a lump would bump and grind under our ice-hardened hull. 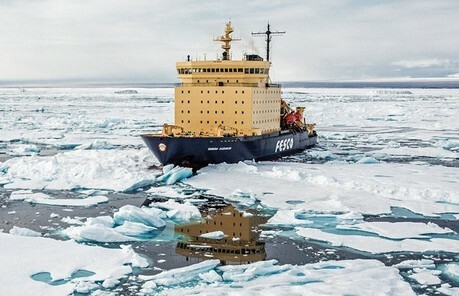 The Professor Kromov had to sail further west to avoid the worst of the ice (visible via sattelite images), arriving at Wrangel early afternoon. We anchored off the south coast and landed the zodiacs at the mouth of a small creek by 1500 hours. After catching up with local rangers Sergei, Uliana and Ginady, we split into 3 groups and headed out across the arid-looking tundra. There were so many wild-flowers that we started a ‘tundra plant club’ to match the evening ‘bird club’ with a round-up of the day’s botanical treasures. 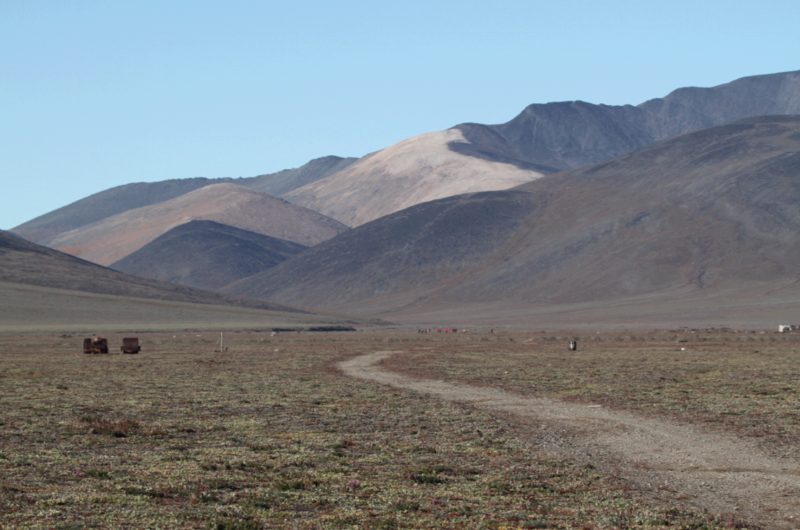 Wrangel is starkly beautiful: a vast tawny tundra plain with wildflowers, framed by low mountain ranges inland. We left a party of 4 behind to take an overland trip across the island via 6-wheeler, guided by Katya and 2 of the local rangers. Placs visited Unexpected Creek, Goose Creek and Ptichy Bazaar around the western end of Wrangel Isalnd. 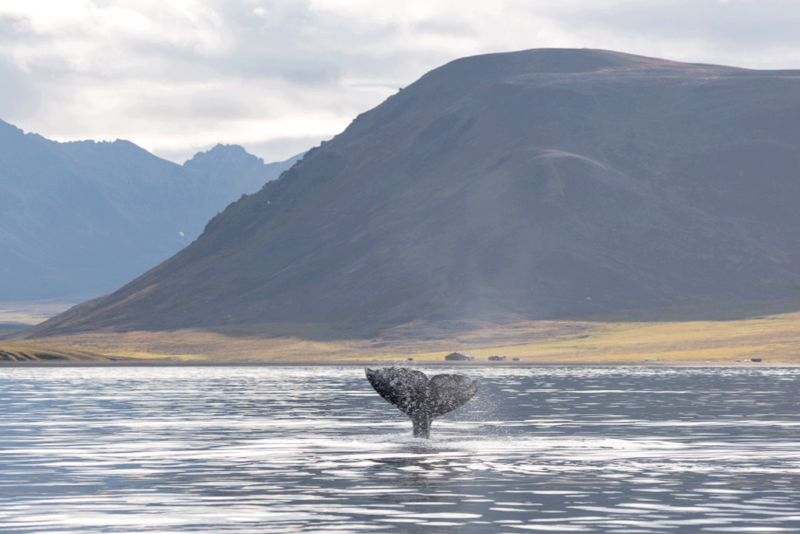 Landscape highlights Wrangel island plains, mountains and sea-cliffs. Zodiac trips Morning: Polar bear on ice floe followed by trip to the lagoon of Unexpected Creek, between Cape Thomas and Cape Blossom. Afternoon: A walk up Goose Creek and back down the spur, or a shorter walk if desired. Evening: After-dinner sunset cruise around the bird-cliffs at Ptichy Bazaar. Another red letter day: Samuel spotted the first polar bear of the trip on an ice floe 500 metres from the ship. We took the zodiacs over quietly and approached the bear from downwind, allowing us to get within 25 metres before it noticed us and trotted off. 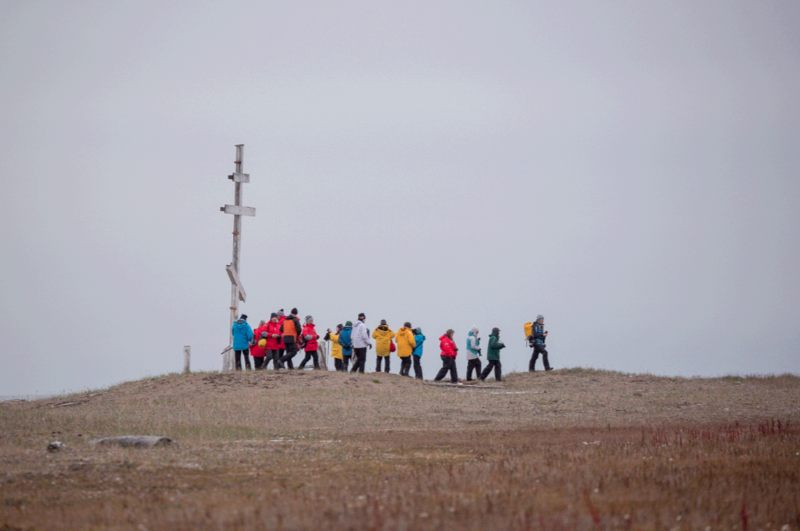 We carried on toward Point Thomas at the eastern end of Wrangel Island, where we had spotted another polar bear and a musk ox. After working our way upwind to the lagoon of Unexpected Creek, we crept on hands and knees to the crest of the gravel spit and sat down quietly to observe two bears lying by the lagoon about 400 metres away. After about an hour a third polar bear came into view from higher in the tundra, strolled down to the beach about 200 metres downwind of us, slipped into the sea and swam down the coast. Meanwhile the musk ox, a mere speck when we first landed, worked its way up the island to within 100 metres of us, before walking on up the coast. Several flocks of migrating snow-geese flew overhead and a bearded seal’s head popped up a stone’s-throw out to sea. With so much happening at the same time it was hard to know which way to point the camera. Eventually a second bear stood up, walked across the tundra and lay down on the beach about 100 metres down-wind of us, from where he sat and watched us. 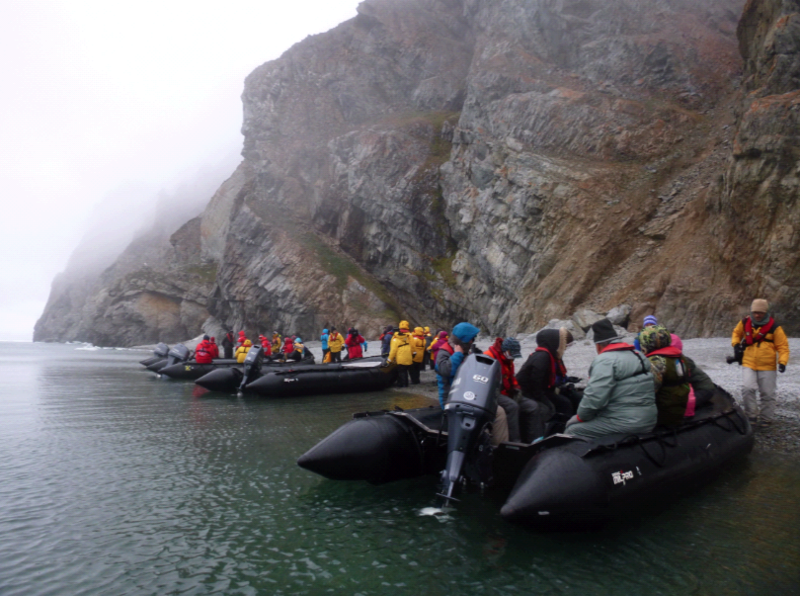 We bunched together to make ourselves look more formidable, as groups broke off and left the beach by zodiac. Once our numbers had dwindled to 6, the bear decided it was time to check us out. It stood and walked up the beach towards us, sniffing the air curiously and opening its mouth to reveal a purple tongue and a very healthy set of teeth. Although the bear was displaying more curiosity than agression, once it came within 25 metres Ginady shot off a flare gun to scare it, but not before we’d captured some stunning photographs and had an experience we’ll never forget. That afternoon we walked up the wide bed of Goose Creek, returning via a windswept spur above it. This gave us stunning vista’s up the braided strands of the river toward the mountains inland. We rounded off the trip with some bird photography at the Goose Stream lagoon, a roosting spot for large groups of Kittywakes and little groups of ruddy turnstones, red and red-necked phaleropes. As if that wasn’t enough, we took an after-dinner zodiac cruise under the sea cliffs at Ptichy Bazaar. This really was the cream on top: The sky alive with guillimots and kittywakes, a cocophany of chicks and parents calling for each other, kittywakes perched all over pieces of sea ice, which lit up blue in the late evening light – a gorgeous finish to a pefect day. Weather Morning fog then overcast, 8°C. Sea conditions Flat and calm with ice floes, sometimes thick. Wildlife highlight Polar bears on the ice! Landscape highlights The mist lifting off the sea, Komsomol Lake, white snow geese flying against a leaden sky. Zodiac trips Along the coast through the mist to Komsommol Lake. Lectures Sarah on the Alcid family (puffins, guillemots, auklets). Chris on the last voyage of the Karluk, which was crushed by ice off Wrangel Island in 1914. The five zodiacs were idling beside the the ship on a dead flat sea in thick fog, preparing to head off to an invisible island. We followed each other in ghostly convoy, keeping the next boat always in sight. Once at the beach we idled up the shoreline looking for wildlife. A raft of long-tailed ducks materialised out of the mist but kept swimming away to the edge of invisibility. A ring necked seal popped its head up. Then the fog lifted a little to reveal flocks of snow-geese grazing on the tundra, an attentive snowy owl parked nearby. We landed quietly and advanced to within photographic range: The starkly white snow geese looked spectacular flying against the leaden grey sky. From there we heard the deep booming calls of walruses, carrying like fog-horns from their haul-outs on the ice 4-5 kilometres away. I scanned the horizon through binoculars to try and see them, but saw instead a grey whale’s round back break the flat surface about a kilometre offshore. We landed at Lake Komsomol, the rangers going ahead to check that polar bears were not in residence at the rangers’ hut there. The fog lifted slowly, leaving wreaths of mist like silk scalves tossed over the hillside. With the mist, the reflections from Lake Komsommol, the tawny pallette of the tundra and the grazing white snow geese, it was a landscape photographer’s paradise. The rangers’ hut beside the lake was a study in improvisation; the original plaster cladding had weathered away on the windward sides and been replaced with short lengths of box wood nailed on to resemble a patchwork quilt; the interior bunks, tables and wash stand were all made from dismantled packing crates. Someone, perhaps a homesick Australian, had carved a sulphur-crested cockatoo from driftwood and hung it on the wall. In the wood shed the chewed spine of a seal lay next to a scooped out hollow: A polar bear had recently been in residence. Only sharp bear spikes sticking out from all the windows and doors of the hut prevented them from moving in there as well. During lunch 2 zodiacs sped off between the ice floes to pick up the passengers who had travelled overland by 6-wheel drive from our landing spot at Doubtful, and dropped off the second group to return via the same route. Back on ship the ‘overlanders’ talk was all about lemmings, arctic foxes, snowy owls and herds of musk oxen. As the ice grew thicker around the ship, groups of walrus mothers and cubs appeared in little knots on the ice floes, nervously watching the ship pass and if it got too close, slipping into the water and diving. Eventually the ice gew so thick that we had to abandon our plan to to reach Herald Island via the north coast of Wrangel. The captain turned her around with difficulty in the thick ice and we headed back around the south coast. We had already seen 9 bears in the distance when a call came through the ship’s intercom, “Bears on the port side!”. We stampeded to the rail and there they were: a mother and cubs less than 50 metres away. The ship was turned for another pass, keeping further out so as not to scare the mother into the water. I have never seen so many gigabytes of camera memory card consumed so fast. Damien an Australian photography tutor summed up the mood of incredulity on deck as we snapped shot after shot after shot with some colourful language. Sea conditions Patchy to thick sea ice, flat water. Lectures Agnes: ‘Sea Ice, the Eighth Continent’. We woke up to a gentle back massage as the Professor bruised her way through ice floes, sending shudders up through the hull. With the ice so dense, Rodney debated the value of pressing on toward Herald Island, still 70 kilometres away. He decided to press on and we were rewarded with more open water past the lee of Wrangel Island, where a northerly wind was dispersing the ice. Suddenly it was bear pandemonium again! A dozen polar bears stood or lay on ice floes all around the ship. Three were only 100 metres away, consuming a freshly killed young walrus, faces a red mask, teeth tearing chunks from the walrus’s chest and abdomen in front of our amazed eyes. “Herald Island ahead!” came over the intercom: We had finally made it to this famously inhospitable intrusion of vertical granite, currently surrounded by ice floes and decked out with streamers of katabatic mist pouring down every crevice. We immediately launched the zodiacs and made for shore, threading our way between ice floes. 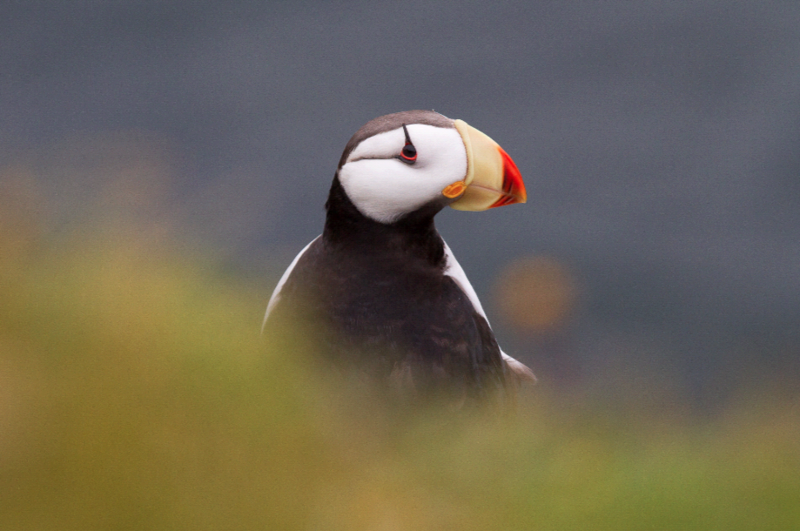 The cliffs were host to thousands of nesting guillemots, puffins and kittywakes. We motored under the cliffs in the lee of the island, the emerald waters crystal clear, before landing briefly on a beach where the bodies of 4 members of the Karluk expedition had been found in the 1920’s. They were a reconnaisance party trying to find a route across the sea ice to Wrangel Island, from where their ship the Karluk had been crushed by ice and sunk. Unfortunately they reached Herald Island instead, where it appears they became trapped by open water. A less hospitable place to land would be hard to imagine, with almost impregnable granite cliffs and tors surrounding the whole island. An hour and a half later the 2nd mate Max called the zodiacs from the bridge to say the ship was rapidly becoming surrounded by ice floes, the current was running fast and fog was rolling in, so ‘please come back to the ship as soon as you can, while you can’. We sped back between the narrowing gaps in the ice to find the ship surrounded, its engines full thrust. Once the captain had extricated her we re-embarked, stowed the zodiacs and set a course back toward Wrangel, arriving at at Krassen Bay off the historic Doubtful Village at 10pm. Another stunning day in the High Arctic. Places visited Anchored at Krassen Bay, Wrangel Island: Visit to wetlands and tundra at Pavlov’s grave, 8km east of Doubtful Village. Weather Overcast, stiff easterly breeze, 8-10°C. Sea conditions Choppy with occasional ice floes. Wildlife highlight What the ‘overlanders’ saw: arctic fox cubs, lemmings, musk ox, snowy owl. Waders at the wetland near Pavlov’s grave. Landscape highlights Last views of the tundra and mountains of Wrangel. A relaxed morning program gave us a chance to sort photos in the morning before a talk about musk-ox from Uliana, a local ranger on Wrangel Island. The herd of around 1000 are all descended from 10 animals, imported from Canada to help complete the natural ecosystem. There is also a small wild herd of reindeer on the island, descended from domesticated animals introduced under Soviet collectivised farming. Their numbers are limited by severe winter ice and wolf predation. We jumped into the zodiacs at 1.30 and beat 12 km up into the wind to ‘Pavlov’s Grave’, the ship unable to get any closer to the landing site in the shallow waters of the bay. Pavlov was a hunter who never wanted to leave the island. He evidently succeeded and his grave behind the pebbly beach is marked by a tall wooden cross and an upturned wooden dory surrounded by walrus skulls. The botanically-minded stayed close to the ground, photographing tundra plants at the extreme margin of their existence in this ‘arctic desert’ ecosytem. And for the birders a wonderful wetland behind Pavlov’s grave yielded ruddy turnstone and dunlin, all frantically feeding to make the most of the brief summer bounty. 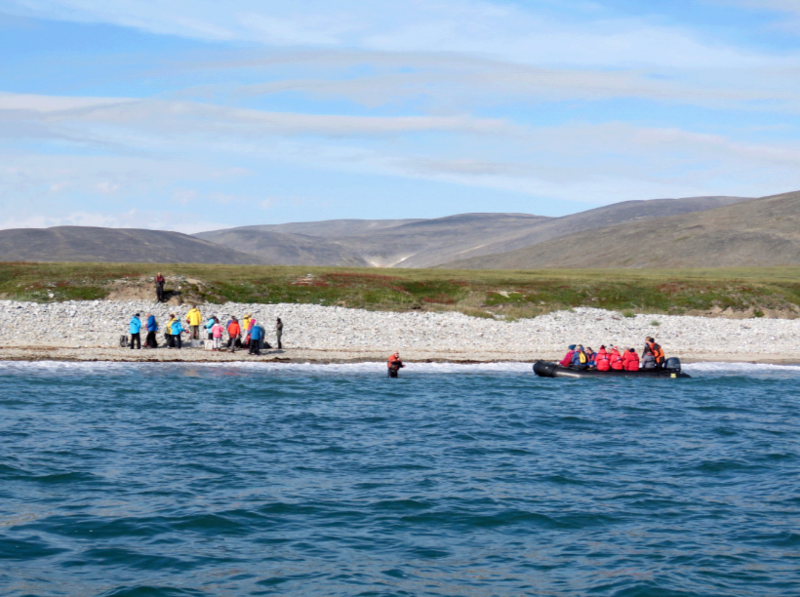 Places visited Wrangel Island to Belyaka Spit at the entrance to Kolyuchin Inlet. Landscape highlights Dusk walk in Belyaka wetlands in Kolyuchin Inlet. Cultural highlight Memorial cross, reindeer herders’ graves and ancient yaranga mounds on Belyaka Spit. Lectures Max on ‘Beringia Park on the World Scene’. Nikita Ovsyanikov’s documentary ‘Life on the Field of Bones’- his polar bear research on Wrangel Island. 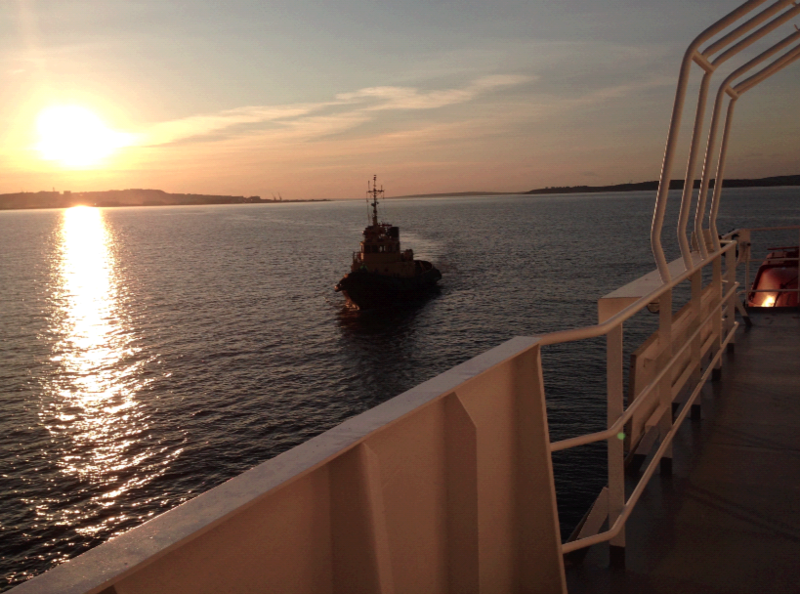 After a full day at sea, an early dinner made time for a twilight (6.30-10.30pm) landing at Belyaka Spit, which forms the entrance to the massive Kolyuchin Inlet. The spit was a conjunction between reindeer herder and marine mammal hunter commununities, whose artefacts, graves and dwelling mounds remain in evidence. The sole inhabitant on our arrival was Alexi, a wading bird researcher living alone in a rudimentary hut beside the lighthouse about 500 metres down the beach. The rifle casually slung over his shoulder was loaded with flare-cartridges due to the recent vagaries of a young brown bear. We delivered him some timber to rebuild a cemetery fence around an old grave behind the beach. We headed out across the tundra, which alternated underfoot between dry sandy ridges (easy travel and populated with the beautifully camouflaged pacific golden plover) and very wet bogs (heavy going) surrounding the numerous ponds. The mournful cry of loons (elsewhere known as divers) drew us toward the open water, where a pair of Pacific loons with chicks were parading up and down the open ater, unsure of our approach. Their smart black and white plumage was stunning and the little shriek that preceded every dive puzzling – is it the avian equivalent of a scuba diver’s flag? A little further out we came to a poignant sight which we respectfully walked around: human skulls and bones lying out in the tundra, their owners’ former posessions scattered around them – sled runners, a rusty rifle, a broken cup, a reindeer-herder’s prod. Katya explained that instead of burying their dead deep in the ground (impossible anyway because of the permafrost), human remains were left exposed on the surface of the tundra, open to the big skies and the elements they had known so well in life. Groups gradually drifted back the zodiacs in the twilight and sat on the beach, chatting and watching the ship’s lights across the water. The serenity was palpable and we were very reluctant to leave. Places visited Ratmanova Island and the Diomedes group. Wildlife highlight The bird-cliffs and sea birds surrounding Ratmanova Island. Absurd moment Super-powers staring across the international date line at each others’ military bases on adjacent islands. We spent the day at sea seeing humpback and grey whales and surrounded by sea birds, their numbers increasing as we neared Ratmanova Island in the Diomedes group. Ratmanova is the easternmost land territory in the Russian Federation and nearest point to the United States of America. In fact the U.S. and Russian military could look at each other’s bases across a strait only 2.3 nautical miles wide. To the casual observer it was hard to understand what benefit each country derived from such an arrangement. It certainly hadn’t helped the marine mammal hunters who were evicted, but it did appear to be working well for the birds, walruses and whales. Wildlife highlight 60-70 grey whales, red-breasted merganser, harlequin ducks en-masse, rough-legged buzzard, sandhill cranes. Cultural feature The local eskimo community catching, cutting up and dividing a grey whale among themselves. Landscape highlights Yttygran Island; morning mist on the surrounding mountains; late afternoon sun lighting up the golden tundra; flat seascapes with grey whales spouting in every direction. Cultural experience A group of eskimo butchering a grey whale for meat. Lectures Too busy for lectures! What a finale! Although we had seen whales spouting on our way north, it had been too rough to take out the zodiacs for ‘up close and personal’ whale-watching. Today we were paid back with interest: The weather was perfect, grey whales spouted in all directions and the surrounding coastline, headlands, mountains and wide valleys completely beguiled us. We were on the water by 8.45am and motoring quietly along the south coast of Yttygran Island. Before we had gone a kilometre Rodney had a readio message from the Bridge that local Eskimo were planning to hunt whales today and that our presence was a problem for that. We negotiated to move further away so as not to disturb their hunt, which is allowed for under a subsistence quoto from the International Whaling Commission. Our 5 zodiacs fanned out and headed for various spouting grey whales before cutting the motors and drifting. The whales, understandably nervous about outboard motors, were unafraid or even curious about a silent boat: They surfaced near us again and again with loud whooshing exhalations of mist from their dual air holes. In deeper water their tails-flukes hung in the air just before they dived; in the shallow waters where they filter small organisms through their baleen plates, they sometimes threw a large pectoral fin skyward as they lay on one side to scoop up and seive productive marine sediments. After lunch Rodney and Katya motored over to ask the whale-hunters if they minded us going over to watch them butchering the whale they’d killed. They were OK with that and so we motored over, not without mixed feelings. The whale, a relatively young female, had been hauled up onto the gravel shoreline, where it was rapidly being cut up, processed and divided amongst the community. Every male old enough to, weilded a long knife and kept it razor-sharp on a whetstone. The skin and blubber were peeled off in huge strips and processed; the skin and outer fat layer cut into chunks to eat raw, the rest of the blubber discarded into the sea. Once the fat was off, the several tonnes of meat were chopped into large chunks and put into plastic bags. 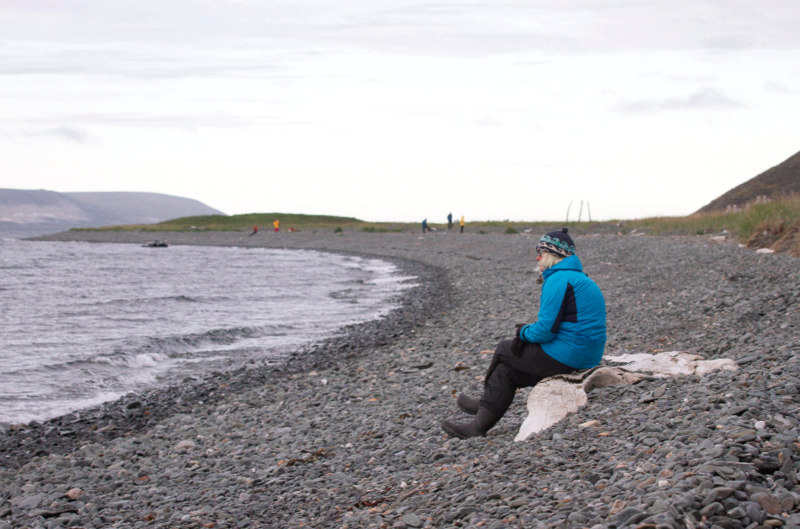 An Eskimo boy of perhaps 7 or 8 stood by the whale’s head for several minutes, staring solemnly at its large closed eye: A penny for his thoughts. After lunch we headed out for a walk, landing by a headland at the western end of the island. We split into 3 groups; the ‘mountain goats’ who climbed a 1500 metre peak, the ‘striders’ who crossed an isthmus to an old marine mammal hunter’s camp and the ‘meanderers’ who walked quietly around the coastline. The day took on a dream-like quality, warm and still, the sea like glass. A pair of sandhill cranes bugling as they glided down a spur; a rough-legged buzzard soaring overhead; the tundra lit up in golds and yellows; and grey whales surfacing all over the flat waters of the strait, their misty spouting backlit by the afternoon sun. Sublime. Wildlife highlight The ship surrounded by fulmars, short-tailed shearwaters, kittywakes and many more. Lectures Rodney on the (formidable) logistics behind a Heritage Expedition. Agnes & Chris on adaptations of the arctic flowering plants and the identification of some of those we saw.